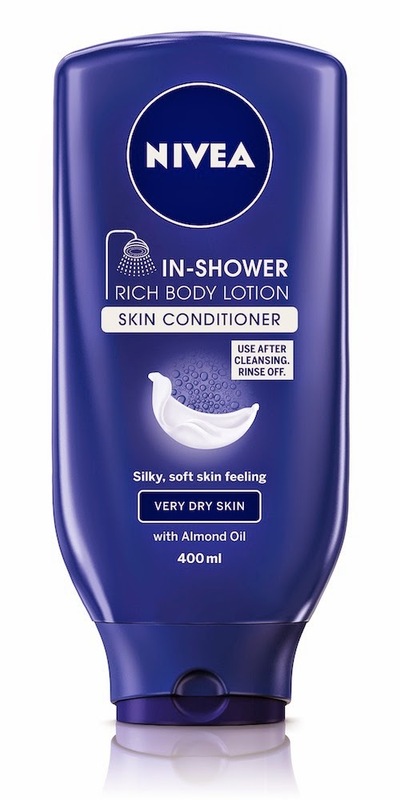 I was super stoked to go out to my mailbox earlier this week and see that I had gotten my Nivea In-Shower Body Lotion sample. I like the idea and theory behind it. I used to lotion after a shower, but then 2 kids later and always running behind, that ended. One thing I hated about lotioning is that you feel sticky and it's hard to get dressed until the lotion has soaked in. So in theory Nivea In-Shower lotion would take care of those worries. When you open it up and put some in your hand, it looks exactly like lotion. Basically you are supposed to wash your body as usual, and then last before you get out use the lotion. The texture, look, and feel are exactly the same as lotion at first glance. It has a pleasant scent. But once you apply it on your body it almost leaves an oily or waxy residue which I found to be unappealing. After showering, it does solve the problem of not being able to dress quickly, it is dry and soaked in by the time you rinse it off and head out of the shower. It doesn't feel sticky, but it does feel waxy like I said. I think it's how they get the lotion to stick through the water. Lastly, does it make your skin feel softer? The answer to this question is yes. It definitely leaves your skin feeling smooth and soft just like lotioning. For me, it isn't a product I would go out and purchase on my own. It was fun to try it out, but that's about where I leave it. Unfortunately I'd say the in-shower lotion is a bust! Note: I received this product for free, but the thoughts and opinions are my own.